Bogen Communications has been a leading provider of communications equipment since 1932. It should be no surprise that when Bogen expanded into the field of audio equipment and sound systems, its products quickly became world renowned for quality and versatility in that arena, too. There is a state-of-the-art Bogen amplifier for virtually every audio need from small systems allowing communications from room to room and phone paging, to large loudspeaker sound systems. The Bogen 6-watt Utility Amplifier accommodates numerous small applications such as sound reinforcement, background music and communications from one room to another. Features for this utility amplifier include adjustable tone control, Lo-Z balanced or unbalanced MIC and AUX, thermal and over-current circuit breakers, 30 Hz-12 kHz frequency response, 8-ohm, 25V or 70V outputs, and sensitivity of 3mV, MIC; 2V, AUX. Versatility the key in an amplifier, and you can find it embodied in the Bogen Amplifier Gold Seal Series. The Bogen Gold Seal Series is available in 35, 60, 100, 150, and 250 Watts. These are extremely flexible units with outstanding dependability, durability and unique built-in features. Each Bogen amplifier in this series provides 7 inputs, true loudness contour function, aural exciter to enhance intelligibility, dual-function, 10-band graphic equalizer with EQ/feedback control, voice-activated Aux muting on Tel input, input muting via contact on all inputs, remote master volume control capability, aux fade after Tel page, tape output connection, and switchable phantom power supply. This Bogen amplifier also provides 4-ohm direct coupled output, 8-ohm, 25V, 25VCT, and 70V outputs as well as pre-amp out/power amp in connections and booster amp output connections. Consider the Bogen Classic Series Amplifier when looking for a public address mixer to accommodate telephone, microphones, and auxiliary sources. The Classic Series provides 4 inputs for MIC, AUX and Tel plus one selectable for MIC or AUX, with each input enabled with a separate volume control. Other features on this series of Bogen amplifiers include thermal protection and electronic shutdown, variable threshold for voice-activated AUX mute, audio output for booster amplifier or tape recorder, TEL input voice-activated AUX input, and outputs for 4-ohm direct, 8-ohm, 16-ohm, 25V and 70V speaker systems, transformer coupled. Today's telephone paging industry requires a quality, versatile amplifier. 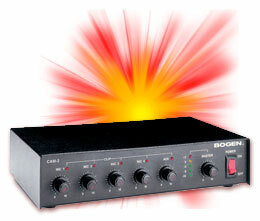 The Bogen 15-Watt Phone Paging Amplifier fills that requirement admirably. This Bogen amplifier is designed for wall mounting and features music input that is mutable on TEL activity. Its TEL input has automatic level control to ensure constant announcement levels, and the unit features separate volume control for music, paging, night ringer, and mic. A Bogen amplifier represents years of excellence, meeting the highest standards in communications technology. Its quality and versatility is highly regarded internationally in the field of audio and sound systems. Why not select from the wide range of Bogen amplifiers and choose excellence today?